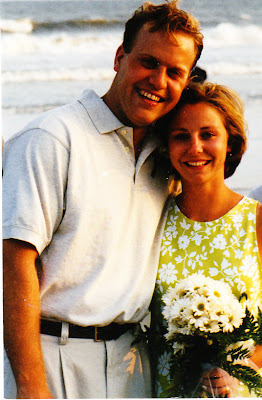 Ten years ago, on a beach on Kiawah Island, SC, Miss Sally and Doug were married. And against all odds and egg timers, she has stuck by my side. Congrats! I've said it before and I'll say it again. Sally should be nominated for Sainthood. I can't imagine all the crap she's had to put up with these past 10 years. 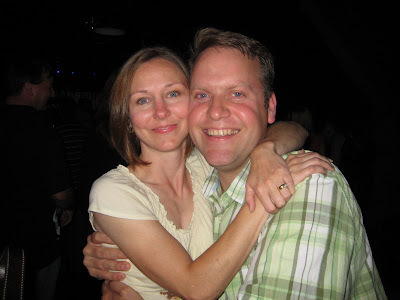 My wife and I celebrated our 10th in July. I don't know how she did it. No offense, but it looks like Sally didn't change. Looks like your head got bigger though. Don't know where I'm going with that, just an observation. you have a giant head. Who's the skinny dude in the first pick? Your forehead looks noticeably bigger. Wait...I don't think that's the same girl in both photos. She looks 10 years younger in the "now" photo. And it might not even be the same guy in both photos. The first one bears a striking resemblance to Arnold Schwarzenegger. Hmmmm. You guys do make a cute couple! Happy 10th! I can't believe she hasn't dumped you.